You are here: Home » Stories and News » River Life » Who Can Canoe the Nahanni River? Canoeing through Canada's deepest river canyons on the Nahanni River in Canada's Northwest Territories. Many people dream of one day canoeing the Nahanni River in Canada’s Northwest Territories – and rightfully so. The Nahanni is a true Canadian wilderness river icon. It’s situated in a mountainous landscape and flows through Canada’s deepest river canyons, past hot springs and geological features so unique that the Nahanni River was declared the first World Heritage Site by the United Nations in 1978. The Nahanni is a mecca for wilderness travellers. 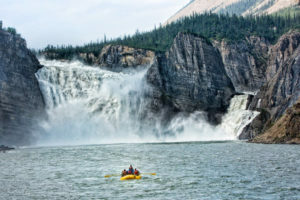 However, the Nahanni is a big river with powerful currents, boils and challenging whitewater. 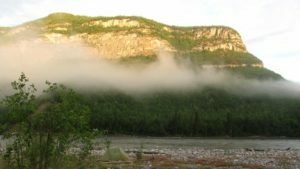 So who can canoe the Nahanni River? 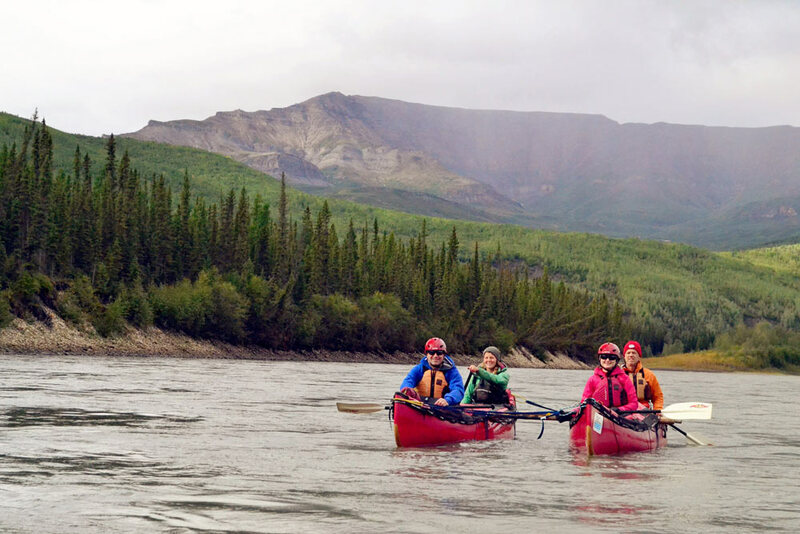 Our raft expeditions on the Nahanni are suitable for novices – no experience needed! 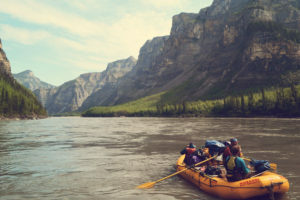 While enjoying a rafting trip on the Nahanni you will still have the opportunity to try out a canoe, as we bring an inflatable canoe on each trip to share among the group for the flat, moving water sections. You can also rent your own dedicated inflatable canoe or kayak. One option is to join either our 8-day or 12-day Nahanni trips that combine expeditions rafts with canoes. You can canoe most of the river, including smaller rapids and swift moving water. In the big whitewater, we can attach the canoes to the rafts, and you enjoy the comfort and safety of our large expeditions rafts as we navigate the more challenging whitewater. A group of paddlers above a set of rapids, with their canoes connected to make a catamaran to provide stability through larger rapids. 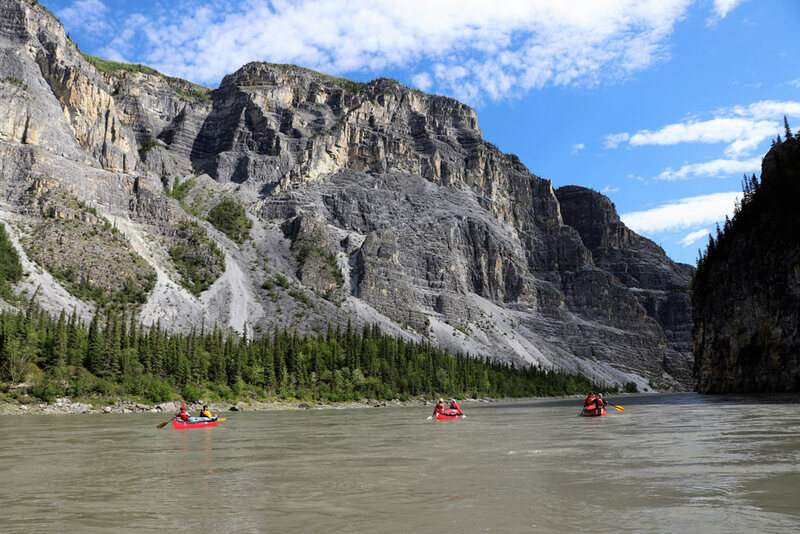 In this short video, Rapid Media’s Scott MacGregor talks with Neil Hartling of Nahanni River Adventures on how to make your dream of paddling the Nahanni River a reality. Beginning with two days of flat water and mountains above Virginia Falls, you canoe from Rabbitkettle Lake to the confluence with the Liard River, this trip is considered a classic for adventurous paddlers.